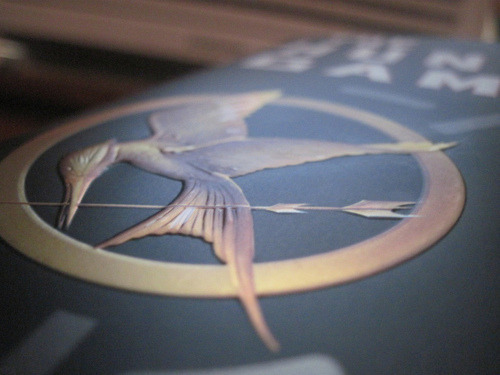 The Hunger Games | Live to read. Read to live. I think I just fell in booklove. I’ve read 80 books so far this year, only a [small] handful them have fallen into the unputdownable category and The Hunger Games is one of them. I read the first half of the first book the night before last, forced myself to stop because I knew I had work the next day and then lay in my dark bedroom wide awake and itching to carry on. The only reason I didn’t was because my boyfriend came to bed and wanted to be asleep! I finished it last night and then read half of the second book and again, didn’t want to stop. I don’t think I’ve done that since Harry Potter (oh, how I long for the days when a brand new Potter would land on my doorstep and I would lock the doors on the world for a few hours until I had devoured it. It makes me sad to think that will never happen again) and that’s saying something. I’m not going to make a comparison between The Hunger Games and Harry Potter because that would make no sense, I’m just going to say this: that I haven’t felt as totally caught up in a book since the first time I read Harry Potter, maybe even other than Harry Potter. That’s how good these books are. I like a bit of dystopian future fiction (thanks for that, Margaret Atwood) because if it’s well done, which luckily for me most of what I’ve read has been, it’s not an out there sci-fi story about a world far outside the realms of possibility, it’s more of a cautionary picture; a ‘look what could happen;’ a world that might not be round the next corner but could well be on the same stretch of road and that’s what you have here. These books are so so thought provoking, they have an intensely exciting plotline, complex and real characters, a full spectrum of emotions and a romance that pulls on your heartstrings. They make you think about survival and identity and relationships and life choices. The story grabs you and never lets go, the heroine gets under your skin, the supporting characters, Peeta and Cinna and Gale and Haymitch are all equally wonderfully drawn and despite the darkness and despair you never lose hope, it’s always there, flickering. I love that every chapter ends at a point that makes it impossible to stop reading; I love the romance; I love the story; I love the way it makes my heart race and then within seconds has me with tears in my eyes; I love the way it just gets to me and how it’s left my thoughts all jumbled. I love how I can’t wait to read the rest of book two and then probably book three straight after.